Al Gore’s movie is getting a lot of attention. It deserves that, because it’s making a good point. We’re wasting the world as we have it and we’re heading for disaster if we don’t start acting today. A .pdf file went viral and it’s going around from mailbox to mailbox. 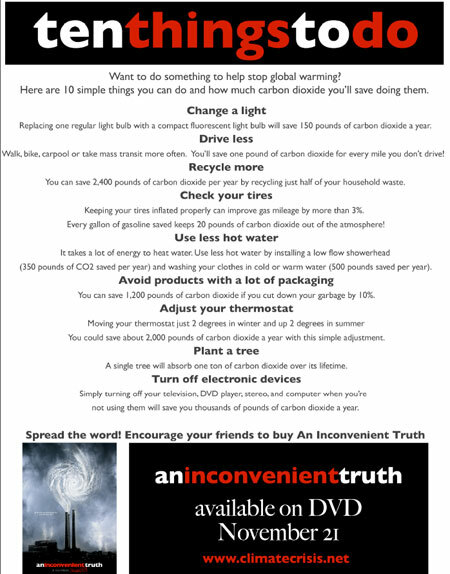 In it, 10 things are listed which you can do (easily) to help save the planet. I’ll list up the 10 things here and add my contribution blogwise instead of forwarding it to my entire address book.